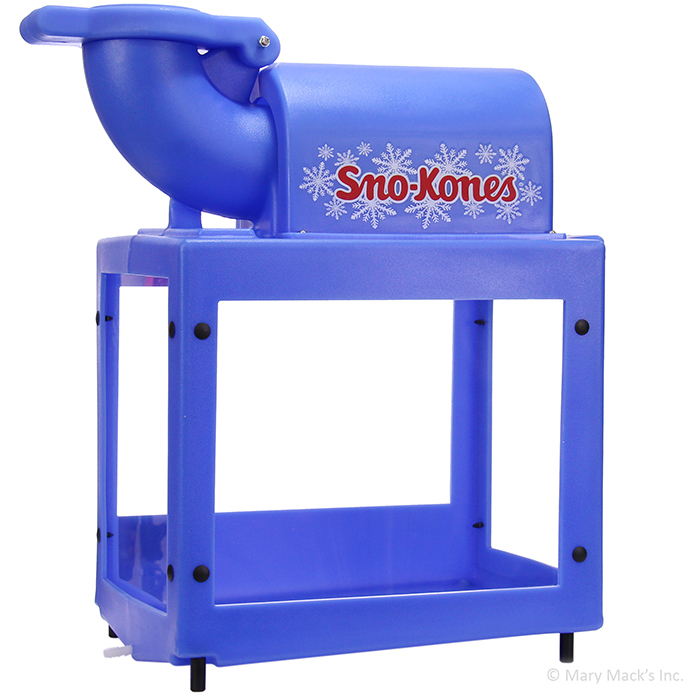 Durable, reliable and capable of processing up to 500 pounds of ice per hour, the 1888 Sno-King is the perfect solution for your large-scale snow cone needs. 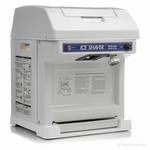 If you run church picnics and socials, or you�re in charge of the family reunion every year, this heavy-duty snow cone machine can meet demand without complex operating procedures or frequent cleanup. With a kill switch, a drain hose and a top-mounted motor, the 1888 Sno-King can help you safely pull off the perfect event. Don�t forget to order a variety of shaved ice syrups for your guests! More questions, check out the FAQ�s above or give us a call at 1-800-620-2869. Ask us how you can get a free copy of Cold Cash, our 110 page shaved ice and snow cone business manual. This manual gives you a comprehensive guide on operating a snow cone business. IMPORTANT: To offer the lowest price to our customers, this item ships Ground directly from the manufacturer. We are unable to ship outside the United States or offer Next Day, Second Day or 3-Day Air on this item. Please call 1-800-620-2869 with any questions! 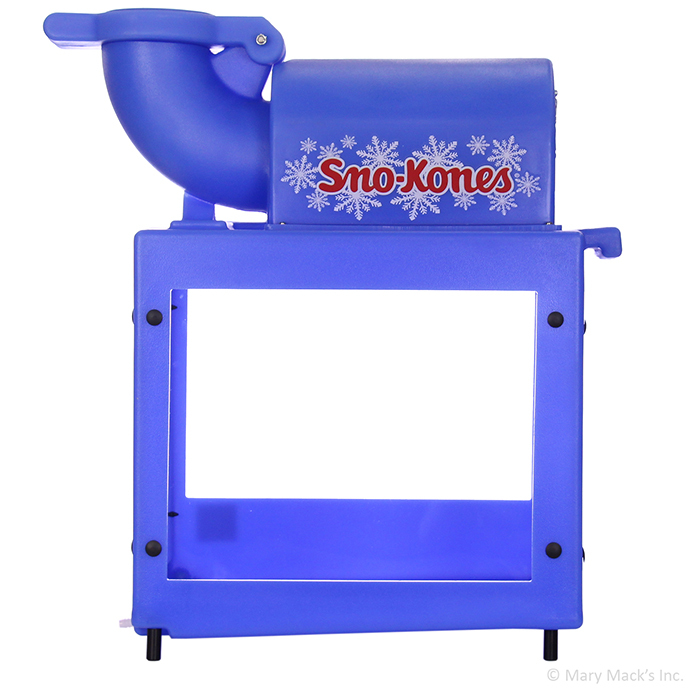 Each Sno-King 1888 Snow Cone Machine is completely assembled and tested at the factory. When you receive your machine, simply remove all packing material and tape before starting operation. We recommend this machine be plugged directly into a wall outlet. The use of extension cords is not recommended due to safety concerns and may cause sacrificed and/or reduced performance. Before you plug in your machine, make sure the wall outlet can accept the grounded plugs on the power cord. The wall outlet must have the proper polarity. If in doubt, have a competent electrician inspect the outlet and correct if necessary. DO NOT use a grounded to ungrounded receptacle adapter. To operate your Sno-King Snow Cone machine, open the feed lever. Using an ice scoop, simply fill the ice chute with cubed ice or bagged ice. This machine is not intended for pellet or flake ice. Flip the on-off switch to the on position. Press the red safety button with your left hand and gently pull down on the feed lever with your right hand. The snow cone ice will start dispensing immediately. When you're finished shaving, go ahead and turn the power switch in the off position. Now you're ready to start shaping your snow cones! Using a snow cone dipper and snow cone cups, fill the snow cone with ice. Next mold a round ball of ice on the top of the cone. When complete, add your favorite Hawaiian Shaved Ice Premium Shaved Ice Syrup and enjoy your flavorful ice! Cleaning the Sno-King is a breeze. Simply use a dry and clean cloth and wipe the outside parts until they are dry. Lift the pusher cap and allow the blade area to air dry. Do not insert your hand in the ice hopper - the blades are very sharp. 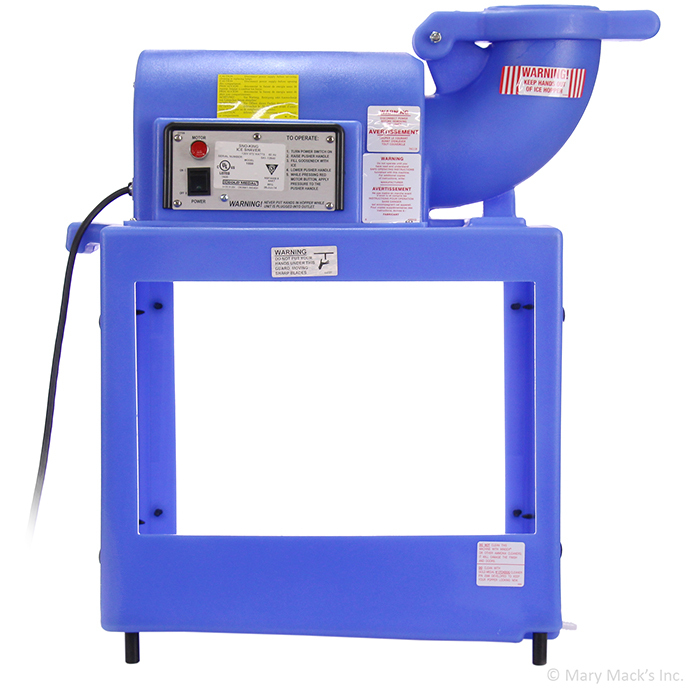 Do not use heavy or abrasive cleaners, as they will damage parts of the machine. Ammonia cleaners will damage the Lexan Windows. 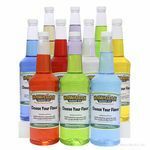 Use only non-ammonia cleaners. This machine features two rotating blades that provide the best snow cone possible. It is recommended that you change your blade every 2,000 - 4,000 servings. Before changing the blade, make sure you unplug the machine first. After you have unplugged the machine, inspect your equipment before replacing the blades. Use a flashlight to examine the blades in the shaver body. If the blades appear to be nicked or bent, then the blades should definitely be replaced. Unplug the main power supply cord from the electrical outlet. Remove the blade head from the motor shaft by loosening the Allen head set screws. (Access to the set screws may be between the hopper and motor or from the underside opening of the hopper inside the cabinet). Remove the blade head. Pull the blade head off of the motor shaft and through the hopper. If the shaver head is frozen onto the shaft, remove the hold down bolts on the motor. Pull the motor back, trapping the shaver head against the inside of the hopper, until the shaver head disengages. After removing the blade head, check the motor shaft for burrs and corrosion. Use a fine tooth file to remove the burrs and corrosion. Remove the blades from the shaver head. These blades may be re-sharpened by a professional. Household sharpeners are not recommended. It is far better to replace the old blades with a new set. Position the new blades and insert screws until they are finger tight. Set the blade thickness equal to a dime. Make sure that the height is even across the blade head. Tighten the blade screws completely. Check the blades again with a dime to ensure the blades did not move while tightening the screws. Replace the motor and blade head. Mount the motor using the hold down bolts. Insert the blade head through the hopper and onto the motor shaft. Press the blade head onto the motor shaft with the pusher handle, and then move the blade head in another 1/8". Check that the blade head is not rubbing against the back of the hopper and the blades are not touching the pusher handle or sides of the hopper. Tighten the set screws in the blade head. NOTE: Replace the shims that were between the motor base and the mounting surface. I think our students would love this for the fun festival at our school. Do you recommend this for events like this? You betcha! This machine is perfect for schools, churches, hospitals, fundraisers, events, etc. In fact, you can even buy it and rent the machine out for others to use! Alright, but we have 200 children to serve. Will it make enough snow for all those munchkins? This machine will pump out 400-500 servings per day. You will have no problem serving 200 servings. Our estimate is based on 8 oz. servings which is a great size for small kids. Since you mentioned kids, can the children in the upper-grades serve this to the younger children? We would love to see kids helping kids. 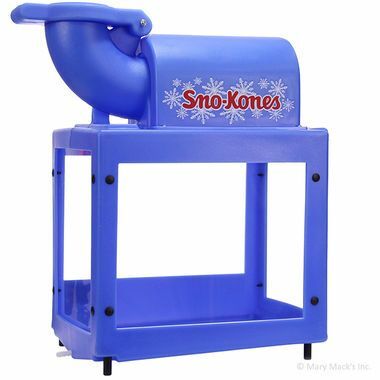 This machine is wonderful for making your own snow cone, no matter what your age! We recommend adults shave a pile of snow in the machine base. Once you have a pile of fresh snow, allow the kids to dip their own snow cones from the back opening in the machine. However, if you're asking us if the older children can run the machine, we recommend you don't. This machine contains a sharp blade and we always recommend adult supervision. I'm glad you mentioned the blade because I'm going to be using this machine a lot! How long with the blade last before changing it? Do you sell replacement blades? Surprisingly, these blades last a long time. When you start producing snow that you're not satisfied with, consider changing your blade out for a new one. We sell replacement blades for the 1888 Sno-King Sno-Kone machine - so let us know when you've got a dull one! I'm afraid the ice will sit in the machine base too long and begin to melt. Do you have a good solution to getting rid of the water when the ice melts? This machine comes with its own handy dandy solution to that problem! Included with this machine is a drain in the base of the machine along with a hose to direct melted ice to the proper place. It's great for keeping ice in and water out! We have an ice maker and plan to use its ice. Will that work? It depends on what type of ice your machine makes. This snow cone machine takes ice that is 1 inch or larger. We recommend typical bag or cubed ice which you can find from your local convenience store or ice distributor. 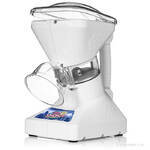 This machine will not produce good results with pellet or flake ice. So if your machine makes cubes 1 inch or larger...you're in business! What if something happens to my machine? Does it come with a warranty? Your machine does come with a 6 month service and 2 year parts warranty warranty. You can always contact our Customer Care department to speak with our friendly team directly at 1-800-742-8334 if you ever have questions about your machine. You mentioned a back opening in the machine, does the back not have a door that I can open and close anytime? This machine actually does have a door for the back opening that you can purchase separately. We definitely think you'll enjoy having that door to help keep bugs out of your machine when it's sitting out at your event. The door is made of the same high-quality plastic as the machine. I love the blue color on this machine but our school colors are green. Do you make them in other colors? Thank you, we like the blue also, but unfortunately, this machine only comes in blue.